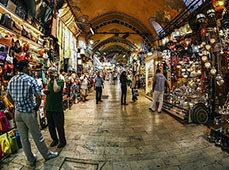 The colourful and chaotic Grand Bazaar is the heart of İstanbul's Old City and has been so for centuries. Starting as a small vaulted bedesten (warehouse) built by order of Mehmet the Conqueror in 1461, it grew to cover a vast area as lanes between the bedesten, neighbouring shops and hans were roofed and the market assumed the sprawling, labyrinthine form that it retains today. When here, be sure to peep through doorways to discover hidden hans, veer down narrow lanes to watch artisans at work and wander the main thoroughfares to differentiate treasures from tourist tack. It's obligatory to drink lots of tea, compare price after price and try your hand at the art of bargaining.